The winners of the VMware Script-O-Mania contest was announced today by Pablo Roesch at VMware Developer Blog. Congratulations to Alan, William and Arnim who won the first three awards! I just took some time to read these scripts even though PowerShell and Perl are not for me. Here I give you a brief introduction of the scripts, what vSphere APIs they used directly or indirectly, and why they topped the contest. Because vSphere API is based on Web Services, you can port the scripts to other languages like Java, .Net, whatever you feel comfortable with. If you want to port any of them using vSphere Java API, I am more than happy to include your contribution. Note that the following comments are strictly my own opinions. A script to add information back into the vSphere client, this script which is designed to run once a day (or more) as a scheduled task, will add a custom attribute to each VM with the creator and date created of that VM. A script to add information back into the vSphere client, this script which is designed to run once a day (or more) as a scheduled task, will add a custom attribute to each VM with the creator and date created of that VM. This article introduces you the basic model and terminologies in vSphere security management, for example, privileges, permissions, roles, and how they are related to each other to secure vSphere. It helps you to better manage the vSphere and program the vSphere API. Much of the content is based on my book VMware VI and vSphere SDK by Prentice Hall. In vSphere, the security model consists of three types of components: privileges, roles, and permissions. A privilege is the basic individual right required to perform an operation. It is statically defined and never changes in a single version of a product. Given the many operations in VI, there are many privileges (for example, the privilege to “power on a virtual machine”). These privileges are represented as strings separated by dots, such as VirtualMachine.Interact.PowerOn. The operations and privileges are not one-to-one mapping. Many operations do share common privileges like System.View. Therefore, there are many fewer privileges defined than methods. In some exceptional cases, a method requires different privileges depending on the target it operates on and the nature of the operation. The CloneVM_Task() method, for example, requires VirtualMachine.Provisioning.Clone for cloning from one virtual machine to another, VirtualMachine.Provisioning.DeployTemplate for cloning from a template to a virtual machine, and so on. A performance counter is a unit of information that can be collected about a managed entity. PerfCounterInfo data object, shown in Figure 1, represents a performance counter. The property key is an integer that uniquely identifies a performance counter, like a primary key of a table in SQL database, and nothing more. There is no guarantee for a performance counter to have a fixed number. In fact, the same performance counter can have different values in ESX and VirtualCenter. Even for the same type of server, the number could change from version to version. Do not use it outside the context of the server you connect to. If you have ever used vSphere Web Service API, you must have known that there is no managed object but ManagedObjectReference object. Understanding it helps deepen your understanding of the vSphere API. Honestly, the ManagedObjectReference is a little confusing by itself. It is in fact a data object but represents a managed object. You can think of a MOR as a pointer in some sense because it’s used to uniquely identify a managed object. Even better, you can think of the “type” and “value” defined in the MOR in the SQL way. The type is like a table name, and the value like the primary key which can uniquely identify a managed object in its type. MOR is really intended to be used by program and should be carefully limited to the scope of where it comes from. That is why it’s hidden from application developers in vSphere Java API. This blog digs into the vSphere inventory structure, and changes in vSphere 4 from VI. It explains the difference between ESX and vCenter inventory tree, why the inventory path you see from vSphere Client doesn’t work with API. Much of the content is adapted from my book VMware VI and vSphere SDK by Prentice Hall. My previous blog introduced the object model of the vSphere API. 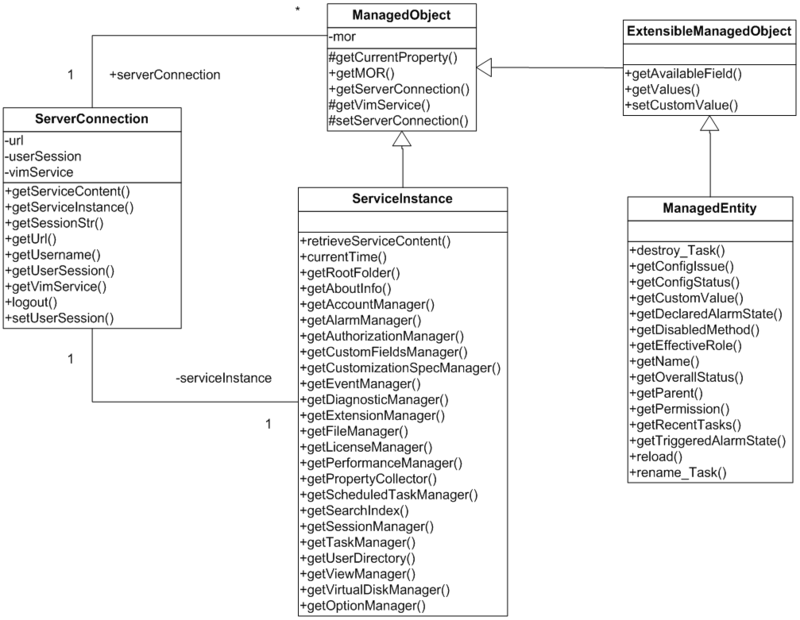 The UML diagram there shows how different managed object types are structured in the inheritance hierarchy. Many of you already know there are some changes in the vSphere API from 2.5 to 4.0. The changes include 20+ new managed object types, additional properties (including sub-properties that embedded inside the first level properties), and several inheritance structure changes. Just got the following email from Andrew Kutz (@sakutz) who wrote the famous VMware Infrastructure (VI) plug-ins whitepaper and created several other great projects like VMM. Several smart bloggers (Eric Sloof, Justin Emerson, Ian Koenig, Alessandro Perilli) discovered the VMware Labs web site over the weekend. As many pointed out, it’s absolutely cool. In vSphere Java API 2.0, I wrote a lightweight caching framework. It’s still experimental but has a great potential to greatly simplify your development work. Commercial companies already use it in their products. The motivation behind this framework is simple – instead of keep polling the changes from the server side, you keep a local cache that is made as fresh as possible. The View in the vSphere Perl toolkit is one way to do. It caches all properties of a managed object despite the fact that you don’t need that many at all. The caching framework in vSphere Java API takes another approach. You tells it what managed objects and what properties you want to be cached. After that, the caching framework does its best to read the properties and keep them as fresh as possible. Architecturally the caching framework is totally separated from the core of the API. You can take it away without any impact on the rest of the API. This is quite different from other toolkit. As a by-product, the vSphere Java API makes Jython programming a lot easier. The following is a very simple sample written in Jython to print out the name of the first virtual machine in inventory. When I start to use a new API/SDK, I always look for the object model diagram before digging into the API Reference. With that, I can have a good overview of the API, from the concepts to the structure. This can save a lot of time. Last summer, Reflex VP engineering Aaron Bawcom visited VMware campus. He is one of the authors of Virtualization For Security: Including Sandboxing, Disaster Recovery, High Availability, Forensic Analysis, And Honeypotting. During our talk, Aaron told me a secret project called VQL. Because it’s a secret, I didn’t talk about it to anyone. Just before the PEX 2010, we exchanged emails about the VQL. Aaron told me it’s already shipped. So it’s time to broadcast it. VQL is a DSL that looks like SQL, easy to understand and easy to use. Unlike SQL on data, it’s on virtual resources in vSphere environment. The following is a quick sample. It gets back the VMs installed with SQL servers with verions newer than 9.2 and they are running 10 minutes ago. While browsing the project home of VI Java API, I found a link to a great tool contributed by pitchcat. It is a standalone Java application that shows managed objects and data objects in a tree hierarchy, and all the methods attached to a managed object.